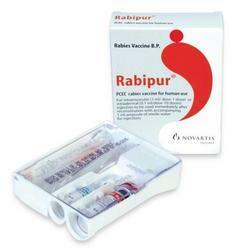 Our offered Rabipur Vaccines / Anti Rabies Injection are primarily used in treatment of rabies and immunization against rabies. These medicines are commonly prescribed by doctors, due to their precise formulation and longer shelf life. The procurement of these medicines is done from notable vendors who process these medicines with high end processing machines and fine quality chemicals. Apart from this, we supply these medicines in durable packaging at pocket friendly rates. We have with us superior quality Abhayrab Vaccine / Anti Rabies Injection which are well known among our customers for their high efficiency and negligible side effects. Our offered medicines are primarily used as vaccination and treatment for rabies in various hospitals and clinics. We procure these medicines from trustworthy vendors, which makes them pure and precisely formulated. The rabies vaccine (or antigen) is carried by antigen presenting cells via the lymphatic drainage to the regional lymph nodes and later to the reticuloendothelial system eliciting a prompt and highly protective antibody response against rabies pathogen. 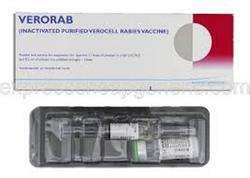 Looking for Anti Rabies Vaccines ?